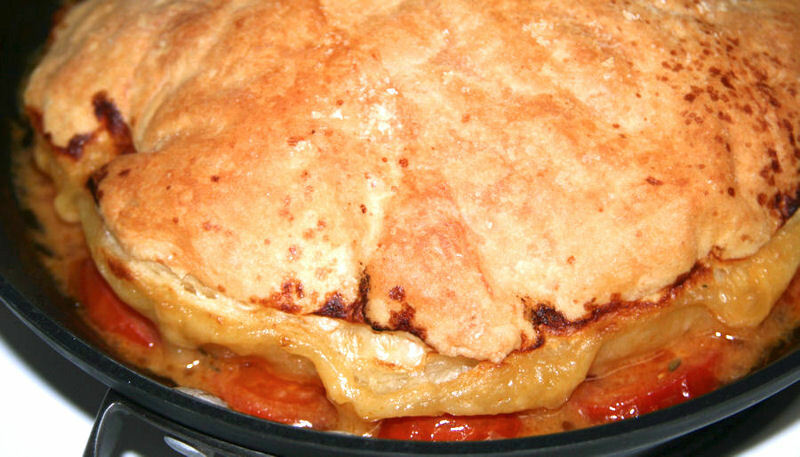 Have you tasted Tomato Tarte Tatin? Do you like pizza or French pastries? Combine these culinary icons to make one of the most scrumptious savory pastries you've ever tasted. 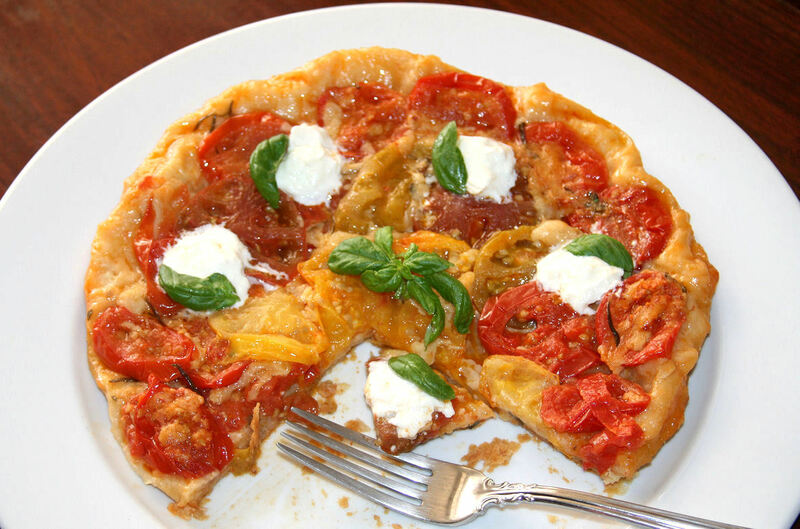 Looking like pizza with a flaky, crisp crust, each bite is buttery goodness napping summer's ripe tomatoes. Tomatoes love butter and cheese, so any combination you choose will taste wonderful. While it looks complicated to make, it is not. The only cooking you do is melt a pat of butter. Then assemble and bake. Clean-up? One pan. It is THE superb party dish! Assemble ahead-of-time, then bake while your guests are mixing cocktails, popping corks, and chatting. When you remove it from the oven and present it, conversation stops and cell phone cameras are clicking! Choosing Tomatoes: Before you purchase tomatoes, think of what shapes, colors, and flavors you want in your new masterpiece. Do you want one type of tomato or a mix of them? Easy-to-grow popular varieties or heirloom tomatoes possessing special tomato-y goodness? Remember, when the baked tart is turned over, the puff pastry frames and showcases the tomatoes, they are the stars of this dish. Their juice creates the sauce otherwise they burn, so avoid dry tomatoes. Their flavor should shine through and balance with the buttery puff pastry so both complement one another. No breadcrumbs are needed to support the tomatoes. No added sugar, either. 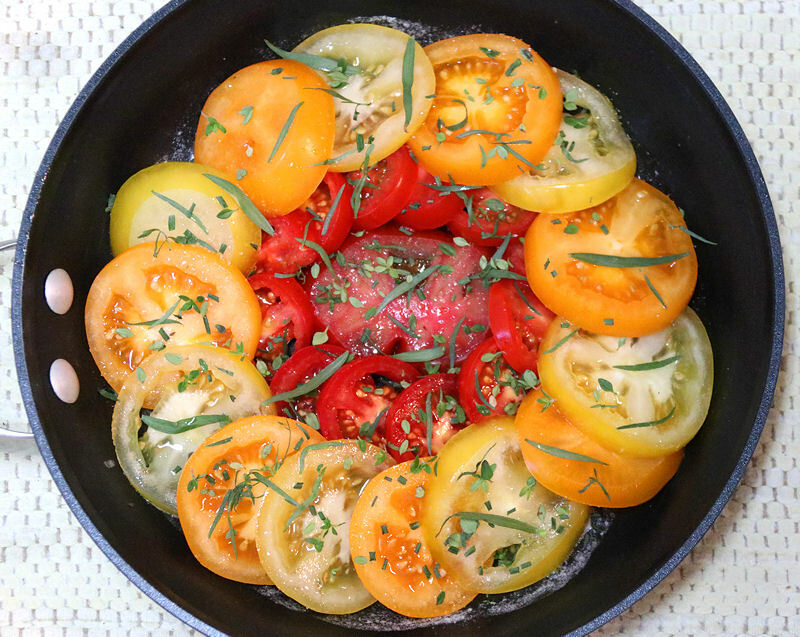 The natural sugars in the tomatoes are enough to sweeten this dish. Choosing Cheese: For the best flavor, include three or more cheeses in this tarte. When assembling, make a layer of grated aged cheese, such as Parmigiano-Reggiano, Asiago, Piave, or Pecorino. Top this with shredded low-moisture Mozzarella, Swiss, and/or Emmanthal. A sprinkle of Greek or French Feta adds a salty spark of flavor. Do not add much. 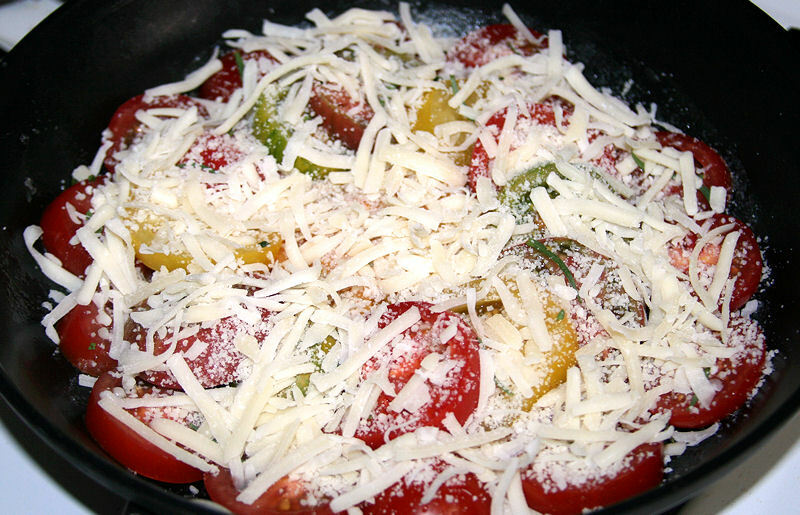 A total volume of 1/2 cup or 120 ml of grated/shredded low-moisture cheese and lattticino is sufficient for topping one layer of sliced tomatoes in a 10-inch (25.4-cm) pan. 4 servings. Baking time is 30 to 40 minutes at 400 F/200 C/Gas Mark 6 for a 10-inch (25-cm) pan; 25 to 35 minutes for an 8-inch (20-cm) pan; 23 to 33 minutes for a 6-inch (15-cm) pan. Baking time depends on how cold the ingredients are when the pan is put into the preheated oven and the amount of fresh tomato juice released during baking. Avoid burning the edges of the dough or tomatoes, so check at 22 to 25 minutes, then monitor. 1. Preparing the Tomatoes and Other Ingredients: Tomato slices compose the first layer placed in the pan before baking, and this is the layer appearing on top of the tarte when plated. Remove the stems. Then cut evenly thick tomato slices about 3/8-inch thick (9.5-cm). If the slices are thicker, they require longer cooking and the puff pastry burns on the top. If the slices are very thin, they burn while the puff pastry is baking. * Briefly drain the tomatoes on absorbent paper towels, for about 10 minutes. This is very important, particularly if the tomatoes are becoming a bit soft and hold a lot of juice. Use the fresh herb leaves, whole or chopped, reserving the stems for another use. Thaw one frozen puff pastry sheet for about 40 minutes, or just until easy to handle while cold. Preheat the oven to 400 F/200 C/Gas Mark 6. 2. The Pan: Choose an ovenproof, non-stick pan with sloping sides so the tarte slides out after baking. These sizes work very well: 6-inch (15-cm) for 2 servings, or 8-inch (20-cm) or 10-inch (25-cm) for 4 servings. Put the butter in the pan. Over low heat, warm just until the butter melts, but do not brown it because the butter continues to cook in the oven. Remove the pan from the heat and cool down. Here are 3 different combinations of fresh tomatoes for you to see how color and shape affect the tarte. Layering technique remains the same for all combinations of tomatoes. A. Melt the butter in the pan. Sprinkle 1/3 of the fresh herbs in the bottom of the pan. Arrange overlapping tomato slices on top. During baking, tomatoes soften and shrink a little, so crowd the pieces together. Lightly salt to taste. B. Sprinkle the remaining 2/3 of the fresh herbs on top of the tomato slices. Distribute Parmigiano-Reggiano, Asiago, Piave, Pecorino Caciotta, or other hard grating cheese on top. Since cheese contains salt, it may not be necessary to add more salt. C. Then sprinkle shredded low-moisture Mozzarella, Swiss, and/or Emmenthal, and crumbled Feta on top. 3. 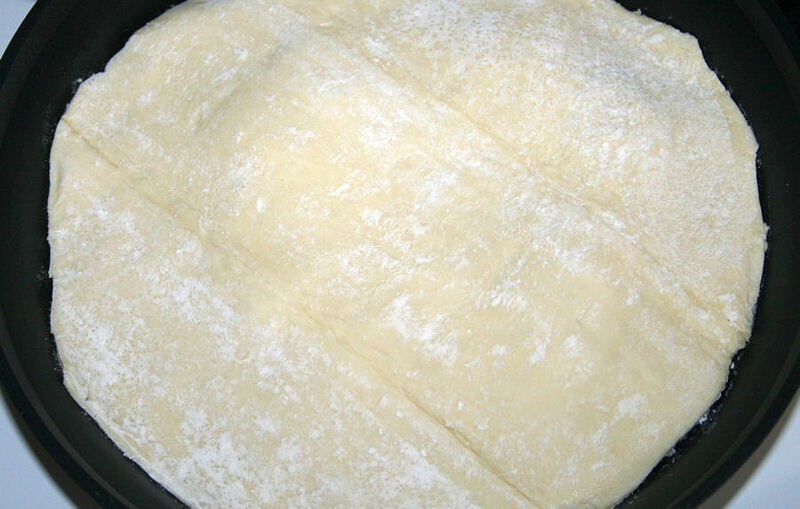 The Puff Pastry Topping: Carefully place the thawed sheet of puff pastry on top as the final layer. Drape it over the layered ingredients in an even layer without folds, and allow it to fall into place naturally during baking. There will be a few hills and valleys, that is fine, because it allows trapped air to help bake the pastry. Using a kitchen shears or sharp paring knife, trim the edges so the pastry completely covers all and touches the side of the pan. Usually I cut the pastry against the side of the pan and that allows enough pastry for shrinking. When trimming, do not press down on the pastry. Leave the pastry completely covering the layers. Do not tuck the pastry ends down into the pan or beneath the tomatoes since tucking in the ends prevents the puff pastry from rising. During baking the pastry shrinks by about 1/2-inch (13-mm) or more exposing the edges of the tomatoes. Prick the pastry intermittently with a fork or sharp tip of a paring knife so it rises slightly and evenly. Do not slash the top of the pastry with a knife because it presses down on the pastry and the pastry does not bake evenly. Do not brush any wash on top of the pastry. *Using a damp paper towel, wipe inside the pan, above the tarte, removing any flour or ingredient bits that could burn during baking. 4. Baking: Place the pan in the center of the preheated 400 F/200 C/Gas Mark 6 oven. 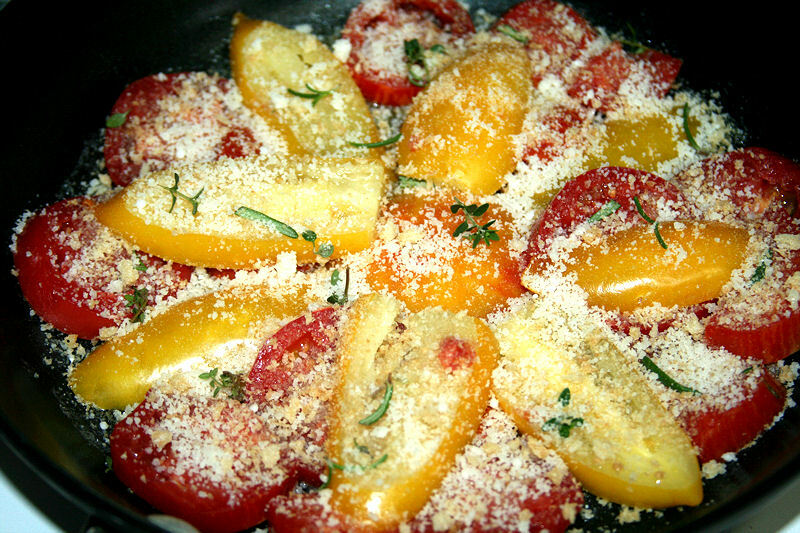 During the first 15 minutes, the tomatoes begins to cook and soften. The puff pastry is rising now. Open the oven door, and quickly turn the pan around a little, by simply moving the pan’s handle from one side of the oven to the other side for more even baking and rising of the puff pastry. Do not pick up the pan, or remove it from the oven, the pastry would collapse. Carefully close the oven door. Do not let it slam shut anytime you’re baking something that is rising, as the jarring could cause the rise to collapse. Begin monitoring the tarte when it has baked for 25 minutes. It may look done with dry golden brown puffed pastry on top, and can be removed now, or continue baking up to 15 minutes more. Baking time depends on how much tomato juice releases during baking, avoid burning the edges of the dough. *Listen. If you hear the pan’s juices drying out, a crackling sound, or if you even begin to smell a hint of burnt tomatoes, remove immediately. Garnish: While the tarte is baking, prepare the garnish. Drain the Burrata, wash and dry the fresh basil leaves. The cooked tomatoes peek out from beneath their buttery blanket of golden puff pastry. The dots along the edges and on the surface of the baked puff pastry are tomato juices. Place a broad plate over the top of the pan, wider than the diameter of the pan. Pick up the handle of the pan, holding the plate over it. Quickly and smoothly turn over the pan and plate. Place the plate down on the counter top with the pan above it and gently lift the pan straight up, not at an angle. While all ingredients should fall out onto the puff pastry, do not be surprised if a few pieces remain inside the pan, simply remove. The pastry shows their indentations so it is easy to put them in the right place. Allow a few minutes more to cool. Use a very sharp knife or sharp kitchen shears to cut through the tarte. Garnish with dollops of Burrata. Accent with fresh basil leaves. Luscious!